We’ve heard about the solder paste “graping” defect, but the same oxidation challenge occurs in other solder forms as well, such as solder washer preforms used to attach small connectors. Solder graping is a defect that arose as a result of small solder paste deposits and higher (than were used in the past) reflow temperatures. The peak reflow temperature for SnPb alloys were just over 200°C, but. with SnAgCu alloys, that peak is as high as 260°C. New solder pastes have been developed that address this defect by utilizing flux chemistries that function as an oxidation barrier. But what about other solder forms? I was recently working with a customer who was evaluating solder preforms for a connector application. 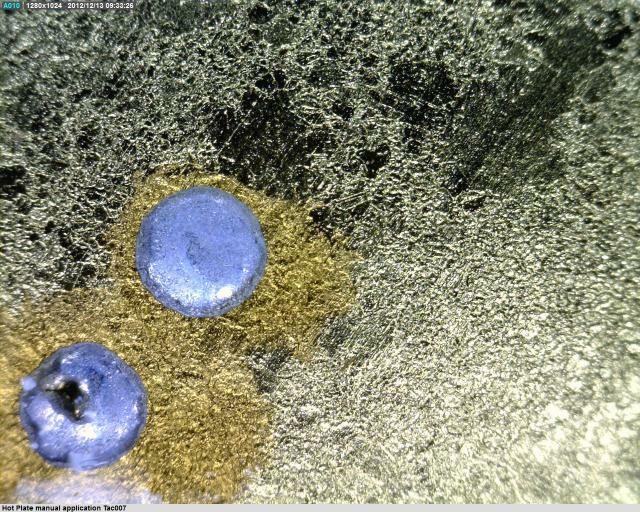 These solder washers (outside diameter of 0.025”), like the small solder paste deposits, had a large surface area with a tendency to oxidize on their heated journey to melting. These washers were made of SnAgCu, so the peak temperature required of them was no different than it would be for Pb-Free solder paste. I found that the same 1°C ramp that causes graping of solder paste can do so for preforms as well. The difference though, is that the non-molten portion of solder takes the shape of its un-reflowed form, that of a small washer in this case, as opposed to the “grapes” of aggregated solder powder. Adjust the reflow profile. Ed Briggs' recommendations work well here. Further, use a fast ramp to peak. I tested the reflow on a hot plate set to 250°C; this improved the wetting. Preforms are unique from solder paste in that they are solid metal, as opposed to a mixture of metal and flux. They do not benefit from the same heating controls that solder paste requires. Reflow in nitrogen. By purging out the environmental oxygen during the reflow process, the solder preform will not oxidize. Apply a tacky RMA flux, such as Tac007. RMA fluxes provide stronger oxidation barriers than other non-rosin flux types. In the second image here, it is evident the improvement these changes made in terms of the spread and coalescence of the solder preforms. Note that the addition of tacky flux left an amber-colored no-clean residue, however, this can easily be washed away using a mild solvent. 你提供的方案可以给客户带来什么？What can your solution really bring to customers?